Apartment in Palermo Nuevo, Buenos Aires - JFK ! Impressive 1700 square feet apartment in the best area of Palermo, across the street from the US Embassy and amazing parks! 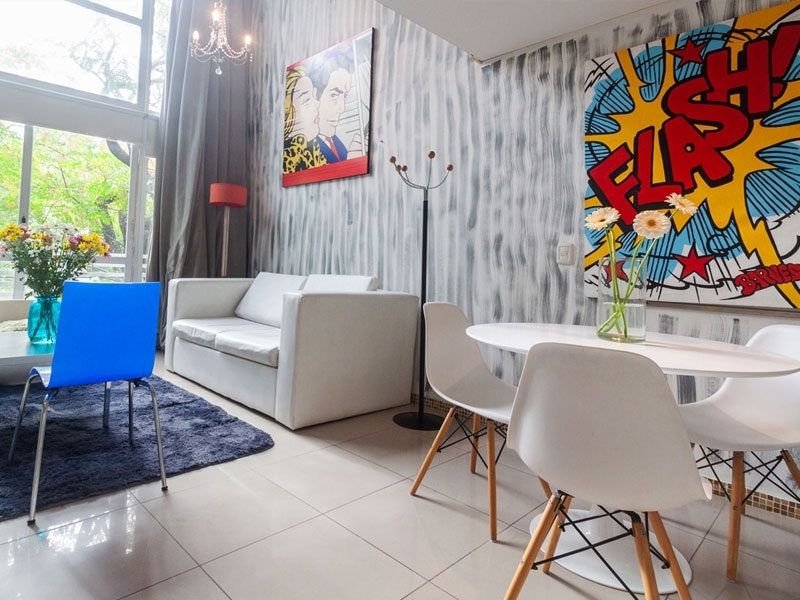 This one bedroom apartment for rent in Buenos Aires is located in what is considered the most exclusive area in the city. Set on Kennedy Ave., this chic apartment is right across the street from the US Embassy, with beautiful park views and just one block away from Libertador Avenue and close to Planetarium, Palermo Gardens and the Rosedal. The apartment is fully renovated and furnished to the highest possible standards. Carefully selected designer furniture and its impressive 80 square meter garden make this the perfect spot from where to explore the city. The living room features a 50’’ screen TV, comfortable seating and dining area. The large glazed windows provide access to the private garden and make this a light filled room from dawn to dusk. The kitchen comes fully equipped with everything you might need for your stay, including a Nespresso coffee maker, in-unit washer-dryer and more. The bedroom faces the quiet street and offers open views of the park across. It also provides access to the balcony. The bedroom features a comfortable queen size bed as well as a 32’’ screen TV and plenty of closet space. The adjoining very well appointed ensuite bathroom has a shower and the second bathroom has a bathtub. Last but not least, the beautiful private garden is the perfect place to relax and unwind after a hard day’s (or night’s) exploring! With your very own private BBQ and a table that can fit up to 8 guests in style, this makes a great opportunity to show off your grilling skills, glass of wine in hand!